If it is not love affair with Mother Earth, it is not Architecture. Prices are for 1 or 2 guests. Additional guests (3 or more) are $25 per person per night (Limit 6 guests total). Refundable security deposit of $500. Please note - to cover operating costs of the Onion House, we need to enforce these terms. Please consider travel insurance to protect yourself from unexpected events that cause cancellation. Full refund requires 60-day notice of cancellation. 50% Refund until 30 days prior. Please contact us with your questions or concerns around your situation. Many people book months ahead, and life is full of unforeseen circumstances. It's ideal to purchase this within 2 weeks of booking with us to avoid the possibility of being denied due to pre-existing or other screening elements. You will have the entire place to yourselves. Privacy in which to swim and sunbathe, enjoying the 70 foot turquoise pool and gardens. Fully appointed kitchen, laundry, WiFi, TV, stereo, outdoor shower, terrace and grill for outdoor dining. Separate master suite. Each bedroom steps out into gardens. Five minutes from town and beaches, yet worlds away. Ideal 'base camp' to explore the Big Island, a 'mini-continent' with almost every climate on earth: tropical rainforests, plunging waterfalls, beaches, snowcapped mountains, world-class diving, and an erupting volcano. The Onion House is not suitable for families with young children (less than 12), or for those who have difficulty with steps, due to safety considerations inherent in its design. We make no representation of the house as accessible. 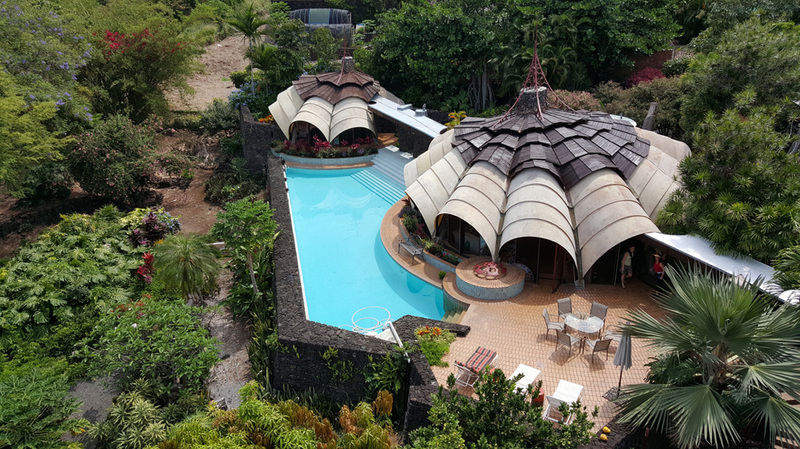 The Onion House is true Organic Architecture - it is not a climate controlled, sterile resort like location. There is no air-conditioning (we use many fans!). It is truly indoor/outdoor living in a shelter of roof, screen, glass and rock cooled by nature passive design. Kailua-Kona is in the tropics, and we instruct guests on best practices to keep tropical visitors at bay (cleaning after meals, putting food away, removing trash daily), but if you've never lived in a tropical environment, you may see more wildlife than you are used to. We have regular and thorough pest control services and clean thoroughly between guests. Even with all that, we can't guarantee that you won't see a member of the vibrant ecosystem that makes Hawaii so unique. Ask us more if you have concerns.